Nomad (Nation of Migration Awakening the Diaspora) is an organisation working with young refugees in North London. “Call Me By My Name” is a performance workshop during which we will explore the many names we have been called by others. the labels that we ourselves and others use to describe how we look and who we are; the insulting and the complimentary, the affectionate and the funny. The performance is open to audience participation and discussion. 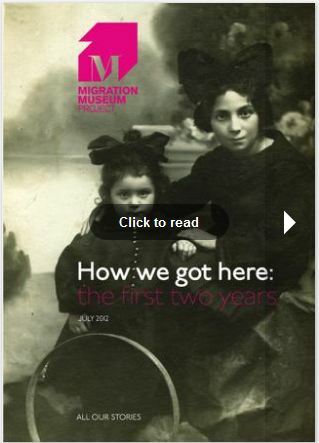 The Migration Museum has just published an update report detailing the first two years of the organisations’s work. Further details of the report and a full text online version can be accessed [here].